Samsung Electronics announced Wednesday that it is now shipping the industry's highest-capacity solid-state drive (SSD), the 15.36TB PM1633a. Samsung revealed it was working on the drive last August, saying it would use the same form factor as for a laptop computer: 2.5-in, but the drive is 15mm in height. Laptop SSDs are typically 9mm, 7mm or 5mm in height (for ultrathin notbooks). The 2.5-in SSD is based on a 12Gbps Serial Attached SCSI (SAS) interface for use in enterprise storage systems. The PM1633a has blazing fast performance, with random read and write speeds of up to 200,000 and 32,000 I/Os per second (IOPS), respectively. It delivers sequential read and write speeds of up to 1200MBps, the company said. A typical SATA SSD can peak at about 550MBps. Because the PM1633a comes in a 2.5-in. form factor, IT managers can fit twice as many of the drives in a standard 19-in. 2U (3.5-in.) rack, compared to an equivalent 3.5-in. storage drive. The SSD also sets a new bar for sustainability, Samsung said. The 15.36TB PM1633a drive supports one full drive write per day, which means 15.36TB of data can be written every day on a single drive without failure over its five-year warranty. The SSD can write from two to 10 times as much data as typical SATA SSDs based on planar MLC and TLC NAND flash technologies. Samsung said it is betting on the PM1633a SSD line-up to "rapidly become" the overwhelming favorite over hard disks for enterprise storage systems. "To satisfy an increasing market need for ultra-high-capacity SAS SSDs from leading enterprise storage system manufacturers, we are directing our best efforts toward meeting our customers' SSD requests," Jung-bae Lee, senior vice president of Samsung Electronic's Application Engineering Team, said in a statement. The performance of the PM1633a SSD is based on four factors: the 3D NAND (vertical NAND or V-NAND) chips; 16GB of DRAM; Samsung's proprietary controller chip; and the 12Gbps SAS interface. The random read IOPS performance is about 1,000 times that of SAS-type hard disk drives and the sequential read and write speeds are more than twice the speed of a typical SATA SSD, the company said. Combining 512 of Samsung's 256Gbit V-NAND memory chips enables the SSD's unprecedented 15.36TB of data storage capacity in a single drive. V-NAND, or 3D NAND, is a way of stacking NAND cells one atop another like a microscopic skyscraper. Not only does it double the density of standard planar NAND chips, from 128Gbits to 256Gbits, it also increases performance. Samsung originally announced the 48-layer V-NAND last August, saying it also sports 3-bits per cell or multi-level cell (MLC) NAND technology. Samsung's 256Gbit, 3D NAND chips. Samsung began mass producing the industry’s first 256Gbit 3D Vertical NAND (V-NAND) flash memory chip based on 48 layers of 3-bit multi-level-cell (MLC) arrays last year. In the V-NAND chip, each cell utilizes the same 3D Charge Trap Flash (CTF) structure in which the cell arrays are stacked vertically to form a 48-storied mass that is electrically connected through 1.8 billion channel holes vertically punching through the arrays by using a special etching technology. In total, each chip contains more than 85.3 billion cells. They each can store 3 bits of data, resulting in 256 billion bits of data -- in other words, 256Gb on a chip that's larger than the tip of a finger. The 256Gb dies are stacked in 16 layers to form a single 512GB package, with a total of 32 NAND flash packages in the 15.36TB drive. Utilizing Samsung's third-generation, 256-gigabit (Gb) V-NAND technology, which stacks cell-arrays in 48 layers, the PM1633a line-up is expected to be faster and more reliable than its predecessor, the PM1633. That model used Samsung's second-generation, 32-layer, 128Gb V-NAND memory. In 2014, Samsung became the first company to announce a 3D NAND flash chip with a 3-bit MLC architecture. In October 2014, the company announced it was mass producing a 32-layer V-NAND chip. Then, last August, it followed up by mass producing a 48-layer V-NAND chip. While Samsung may be the first to do so, it's not alone in developing 48-layer 3D NAND chips. Last year, SanDisk and Toshiba announced that they were also preparing to manufacture 256Gbit, 3-bit-per-cell (X3) 48-layer 3D NAND flash chips that offer twice the capacity of their previously densest memory. Last year, SanDisk and Toshiba announced they are making 256Gbit (32GB), 3-bit-per-cell (X3) 48-layer 3D NAND flash chips that offer twice the capacity of the next densest memory. 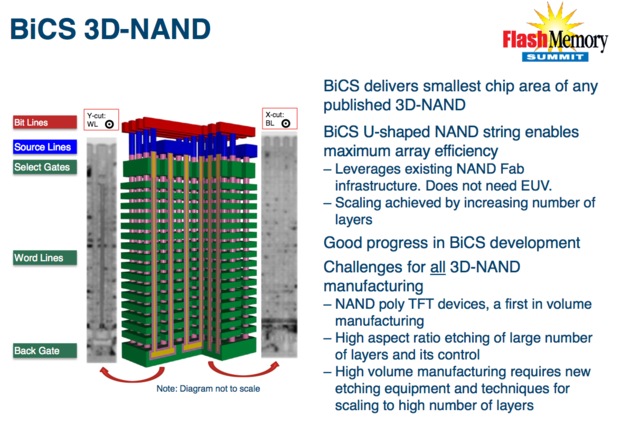 The 3D NAND technology is called BiCS, short for Bit Cost Scaling. Intel and Micron have also announced 3D NAND products. The two companies boasted that their technology would enable gum-stick-sized SSDs with more than 3.5 terabytes (TB) of storage and standard 2.5-in. SSDs with greater than 10TB. Along with the 15.36TB model, Samsung will offer the PM1633a SSD in 7.68TB, 3.84TB, 1.92TB, 960GB and 480GB versions later this year. Because the SSDs are targeted at enterprise use, and will be sold to resellers who'll determine the retail prices, Samsung did not announce its own pricing for the drives.